Jharkhand: Tibetan Parliament Delegation comprising of parliamentarian Ven. Khenpo Kadak Ngodup Sonam, Mr. Tenzin Jamyang, and Ms. Tsering Lhamo continue their Tibet Advocacy Program in Jharkhand. The delegation called upon the Governor, Speaker, Chief Minister and other dignitaries of Jharkhand state on 16th November. On the morning, the delegation met with the Governor of Jharkhand, Smt. Droupati Murmu and spent half an hour with the governor. During the meeting, the delegation thanked the government and people of India and discussed on the current deteriorating situation inside Tibet and updated about the restriction in preserving Tibetan religion and culture, destruction of Tibetan fragile environment. The delegation also thanked the Governor for the support and assistance they have rendered towards the Tibetan sweater sellers in Jharkhand and solicited them for their continued support. The governor expressed his solidarity toward the Tibetan People and assured his continual support and to visit Potala Sweater Market in the future. Later in the afternoon, the delegation met with Shri Dinesh Oraon, Speaker of Jharkhand Legislative Assembly. The delegation briefed about the current situation of Tibetans and discussed the Drichu River and Doklam issues. The delegation also informed about Middle Way Policy of Central Tibetan Administration. Shri Dinesh Oraon also directed the official media of Jharkhand Vidhan Sabha to cover the discussion on Tibet issue. 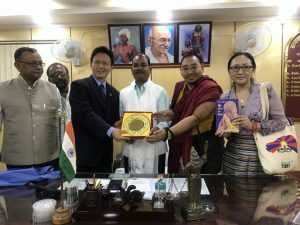 The Tibetan delegations were later taken to visit their Legislative Assembly Hall by Shri Mahinder Singh Prasad, Secretary General of Jharkhand Vidhan Sabha and informed about its composition and proceedings. The delegation then called upon the Chief Minister of Jharkhand, Shri Raghubar Das and Secretary General of Jharkhand Secretariat in the evening. The CM posed questions on the population of Tibetans in Tibet and in Exile which were answered by Tibetan delegation. The delegation informed the CM about Tibetan religion and scripts’ originating from India and how Tibetans are trying to revive our religion and culture. They also informed about Middle Way Policy of CTA and that we are not seeking independence but a genuine autonomy for the Tibetans living in all the three provinces of Tibet. The delegation solicited the CM for his continued support to the Tibetan sweater seller in Jharkhand. The Chief Minister spoke about his plan to build Buddha statue in his state and to invite His Holiness the Dalai Lama to inaugurate the new statue. He also enunciated about his visit to Beijing, capital of China. The delegation later met Sanjay Seth, Chairman of Jharkhand Khadi Gramodyog Board India and they were taken for a tour in the khadi factory. The delegation also met with Sudesh Kumar Chandravanshi, Regional Convener and core group member for Tibetan cause, Shri Rajan, member of Tibet support group and Tenzin Lhundup, vice chairman of Tibetan Sweater seller, Jharkhand. On 17th November, The Tibetan Parliamentary Delegation continues the Tibet advocacy program in Ranchi, capital of Jharkhand state. The delegation met Shri Sudhir Tripathi, Chief Secretary of Jharkhand in the afternoon. 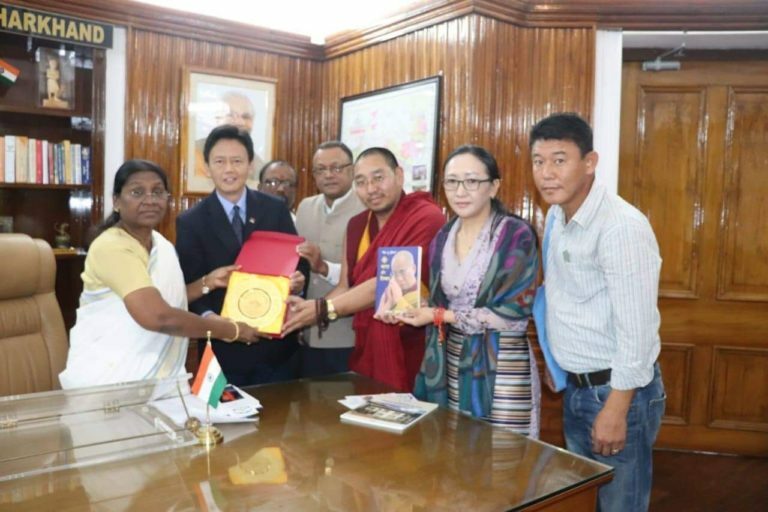 The delegation apprised him of ‘Thank you India’ program initiated by Central Tibetan Administration to mark the 60 years in-exile and to Thank the government and people of India for all their support. The delegation also apprised on the status of Tibetans in Tibet and in exile, reviving of Tibetan religion and culture and application submitted by Tibetan sweater sellers in Jharkhand regarding difficulties they are facing. The Chief Secretary assured to write a letter to the Central and State government regarding Tibet cause. 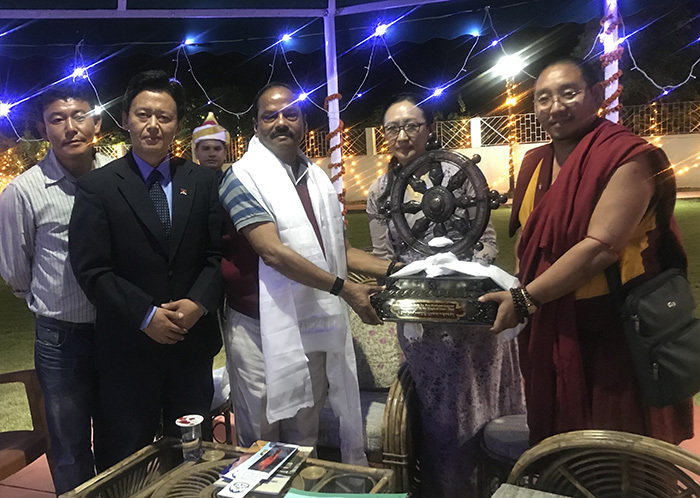 Later, in the evening, the delegation called upon Shri Saryu Rai, State Minister of Parliamentary Affairs, Food Public Distribution and Consumer affair and apprised about Tibet cause, rivers of India that originates from Tibet and other urgent matter concerning Tibet. The minister showed strong respect and faith to His Holiness the Dalai Lama and assured his support to Central Tibetan Administration. The delegation along with the chairman and vice chairman of Tibetan Sweater sellers met Shri Chandra Prakash Choudhary, State Minister of Water Resources, Drinking Water and Sanitation and Leader of All Jharkhand Student Union. The delegation apprised on the Thank you India Program initiated by Central Tibetan Administration to mark the 60 years in-exile and to thank the government and people of India and also apprised the minister on the relationship shared between India and Tibet in the past and the major rivers that flows from Tibet to India, Nepal, Burma and Pakistan.